LONDON, England (CNN) -- Their posts express shock, numbness, a sense of disbelief at the horror unfolding even as they type. 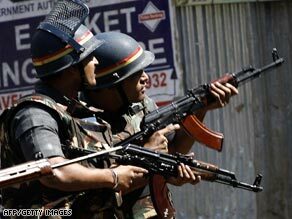 Details of the Mumbai terror attacks unfolded online as bloggers wrote personal accounts and replied to pleas for help. Bloggers have reacted to the multiple terror attacks on Mumbai by logging on to express their views, share information and offer help to people looking for missing friends, relatives and colleagues. "I think it's been an outpouring," said Neha Viswanathan, a volunteer who monitors the blogosphere for online community Global Voices. "I haven't seen anything like this since I started watching blogs closely in the last three to four years. "People are using it as venting space right now. There is one stream of blogs that is talking about their own personal experiences; there's a lot of sadness and a lot of anger." Twenty-nine-year-old blogger Harish Iyer started his post -- Terror in Bombay -- soon after the attacks started. He published his mobile phone number and email address. In the 20 or so hours since midnight in Mumbai, November 27, he's received around sixty phone calls and 100 emails from people desperate to find loved ones. A man phoned him from Singapore looking for his father who was staying in Mumbai. "He was frantically trying and he called me up," Iyer told CNN. "He was literally in tears. He couldn't speak, his voice was choked." "He was telling me that he was dialing the numbers for his father, but he couldn't dial the numbers properly. His hands were shaking and he was shivering." "I took the number and called up his father and his father was fine." Iyer started his blog after seeing posts on the Mumbaihelp blog. A list of the dead and injured has been posted there -- they say it's an official list obtained from a journalist friend -- along with phone numbers for emergency services, hotels and the local police. It was started by blogger Peter Griffin, who goes by the username zigzagly, three years ago based on the model setup after the Asian Tsunami. He too posted his mobile phone number on the blog site and has been taking calls. In the last 24 hours, more than 14,000 people have visited the site, including 9,000 unique users. Griffin is not the only person responding to appeals for help on the site. He says bloggers reading the messages from distraught relatives are volunteering to make inquiries on their behalf. "Anyone who comes in there is trying to help," Griffin told CNN. "A lot of people who know we've done this kind of thing before. There's a bunch of Indian bloggers in the U.S. who are getting a lot of information." One blogger "ruth-less" wrote: "My Parents are Americans trapped in the Taj tower on the 17th floor. They have been held there for over 13 hours. They are very afraid as am I." Harish Iyer volunteered to help find them. He called the Taj Helpline on behalf of "ruth-less" but is still waiting to hear back. Neha Viswanathan told CNN that, in the aftermath of the attacks, those who aren't waiting for news of loved ones are expressing anger at the government and some local media sources. "Some of the blogs say it doesn't look like the government is doing enough, overall, in terms of intelligence. "Throughout last night we didn't hear anything from the Prime Minister or anything else." Bloggers have also criticized coverage on local television stations. "In a lot of the blogs I've read, people are really angry with one or two news channels in particular who they say have created panic," Viswanathan said. "Trust me, they're on full panic mode right now. It's not helpful when the city's already reeling from terror shocks. Blogs have approached this with calm more so than the mainstream media has."